It’s fair to say I really appreciated how lucky I was, having the chance to see not one but three of the newest and biggest cruise ships in the world – namely Royal Princess, Anthem of the Seas and Britannia – in a truly ship-packed (and it has to be said, food-packed) three days. Of course, this wasn’t all down to coincidence. OK, Princess Cruises, Royal Caribbean and P&O Cruises who operate the aforementioned leviathans would have been at the always-busy Southampton regardless but it was seen as the perfect chance to hold the CLIA 2015 Selling Cruise Conference. This, in turn, was seen as the perfect event at which to hold the first Cruise118.com conference, so as a result a good 70 of us departed Cruise118 Towers at an eye-rubbing 5am to make the trip down by coach to cruise central. The CLIA conference itself was a slick and professional affair, with the association’s own Andy Harmer and Travel Weekly’s editor-in-chief Lucy Huxley proving to be a winning double-act for the duration of the three days, holding interviews, fielding questions and playing host to cruise line representatives eager to show us all the best of what their respective lines had to offer. 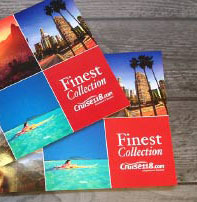 Of course, the best advertisements of all were the ships themselves and visits took place before and after each CLIA conference session – naturally on-board each ship’s largest entertainment venue. So, rather than offer you a step by step walkthrough of each ship, I thought I’d share with you which I thought really stood out in a certain area, whether that be design, food, or facilities. It’s fair to say that P&O is a cruise line with a reputation for being a favourite among British cruisers, but that certainly doesn’t mean a dinner table graced with Sunday roasts, curries and fish and chips. OK, some of those dishes may well be there in an exotic form but with such a wide choice on the menu and impressed comments all round (but mostly noises – the food was too good to ignore for too long) Britannia won hands down when it came to cuisine. From succulent joints of meat and flavoursome curries to afternoon tea and cakes from world-renowned celebrity chef Eric Lanlard, there really was something for everyone, and my aubergine-based main proved that there was some serious thought going into the vegetarian options too, not just the usual mushroom-based dish. I was pleasantly surprised by the emphasis Princess put on its lectures, proving that there’s more to knowledge at sea than a lectern, projector and well-loved TV pundit or author. The line’s association with the Discovery Channel means there’s a nature-based quiz for young and old, which both entertains and educates. The ship’s Discovery at Sea program was also great in that it offered budding stargazers everything they needed to get involved in astrology, from a dedicated app to movies about the stars, under the stars, thanks to the ship’s giant on-deck screen. I’m certainly no stranger to Royal Caribbean’s claims of technical wizardry and thought I’d prepared myself for what to expect. I was wrong. To borrow one of the line’s oft-used words, I was truly wowed by Anthem of the Seas’ innovations. The soaring North Star viewing platform was even more impressive than I thought it would be and needless to say, the queues were lengthy to take a trip 300 feet up into the air. The robot bartender at the Bionic Bar had everyone impressed, with digital menus and statistics adding a further dimension to choosing your favourite tipple. All three of the ships I visited had a distinct style of their own but for me, Britannia balanced classic cruising style with a sleek modern look perfectly. As a P&O cruiser, based on my previous experience I was expecting something, shall we say a little more traditional, but Britannia’s décor truly took me by surprise. During our time on-board we were told about the time, thought and money that had been invested in the ship’s design and it truly did pay off. It sounds a little corny to say ’Britannia is P&O in the future’ but to be honest, that’s the best way I could describe the ship to the uninitiated. Sleek modern hotel spaces, refined restaurants, tasteful artworks and a lot of light made her a ship to remember. Ahhh the top deck. The place to go to take in the air, enjoy the view, relax with a drink and of course, sunbathe. All the ships certainly had plenty happening on-deck and while it didn’t boast the sheer number of facilities as Anthem, Royal Princess took the crown on this one for a few reasons. First of all, there was plenty of space for relaxing, taking a dip and soaking up the rays but the presence of the giant Movies Under the Stars screen made me think how transformed this space would be at night. Also, the Seawalk was a great way to get both your seas legs and a head for heights, offering great views out to sea and the rest of the ship below. Anthem was, without doubt, the clear winner here. I’ve already mentioned some of the incredible technical innovations but no surprises that there was plenty more to discover. The huge Roboscreens in Two70 were one of the numerous stars of the show, moving in perfect sync and adding a whole new dimension to what can be done with film and music. The first dodgems at sea share an innovative space that transforms at night and though we visited in the day, we got to see the moving DJ booth in full effect. It’s fair to say that Royal loves its robot arms. Then there were the dining venues – an incredible choice of very distinct spaces, with Jamie’s Italian offering an authentically homely feel. For fantastic deals on Anthem of the Seas cruises click here. See the latest offers for voyages aboard P&O Cruises’ Britannia here. Or find a Royal Princess cruise for an amazing price here.